Own The Crown Season 1 - Collectors Edition Blu-Ray from Deff, DVD, Blu-Ray & 4K Video Specialists - Free UK Delivery.. The British Empire is in decline, the political world is in disarray, and a young woman takes the throne....a new era is dawning. Queen Elizabeth II is a 25-year-old newlywed faced with the daunting prospect of leading the world's most famous monarchy while forging a relationship with legendary Prime Minister Sir Winston Churchill. 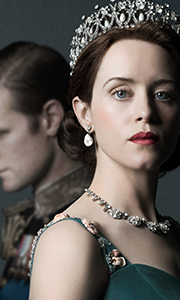 Golden Globe winner for Best TV Drama Series, "The Crown," created by Peter Morgan, explores the Queen's p..
Own The Crown Season 1 DVD from Deff, DVD, Blu-Ray & 4K Video Specialists - Free UK Delivery..
Own The Crown Season 1 - Collectors Edition DVD from Deff, DVD, Blu-Ray & 4K Video Specialists - Free UK Delivery.. The Crown, created by Peter Morgan, follows Queen Elizabeth through the late 1950s and early ‘60s as she struggles to navigate a world that’s changing around her. She must face the challenges of a new era, from the Suez Canal crisis to the assassination of John F. Kennedy, while preserving both the monarchy and her marriage.Special Features • Fact or Fiction: Breaking Down the Pivotal Scandals featurette • Teatime Trivia on Every Epis.. The Crown, created by Peter Morgan, follows Queen Elizabeth through the late 1950s and early ‘60s as she struggles to navigate a world that’s changing around her. She must face the challenges of a new era, from the Suez Canal crisis to the assassination of John F. Kennedy, while preserving both the monarchy and her marriage.Special Features (all formats) • The Royal Rules of Etiquette featurette • Horses and Hounds: The Queen’s Compan.. SEASON 1 The British Empire is in decline, the political world is in disarray, and a young woman takes the throne... a new era is dawning. Queen Elizabeth II is a 25-year-old newlywed faced with the daunting prospect of leading the world’s most famous monarchy while forging a relationship with legendary Prime Minister Sir Winston Churchill. Golden Globe® winner for Best TV Drama Series, “The Crown,” created by Peter Morgan, explores the..